Identities, not systems, are the new security perimeter for any digital business, with 81% of breaches involving weak, default or stolen passwords. 53% of enterprises feel they are more susceptible to threats since 2015. 51% of enterprises suffered at least one breach in the past 12 months and malicious insider incidents increased 11% year-over-year. These and many other fascinating insights are from SecurIT: the Zero Trust Summit for CIOs and CISOs held last month in San Francisco, CA. CIO and CSO produced the event that included informative discussions and panels on how enterprises are adopting Next-Gen Access (NGA) and enabling Zero Trust Security (ZTS). What made the event noteworthy were the insights gained from presentations and panels where senior IT executives from Akamai, Centrify, Cisco, Cylance, EdgeWise, Fortinet, Intel, Live Nation Entertainment and YapStone shared their key insights and lessons learned from implementing Zero Trust Security. Zero Trust’s creator is John Kindervag, a former Forrester Analyst, and Field CTO at Palo Alto Networks. Zero Trust Security is predicated on the concept that an organization doesn’t trust anything inside or outside its boundaries and instead verifies anything and everything before granting access. Please see Dr. Chase Cunningham’s excellent recent blog post, What ZTX means for vendors and users, for an overview of the current state of ZTS. Dr. Chase Cunningham is a Principal Analyst at Forrester. Identities, not systems, are the new security perimeter for any digital business, with 81% of breaches involving weak, default or stolen passwords. Tom Kemp, Co-Founder, and CEO, Centrify, provided key insights into the current state of enterprise IT security and how existing methods aren’t scaling completely enough to protect every application, endpoint, and infrastructure of any digital business. He illustrated how $86B was spent on cybersecurity, yet a stunning 66% of companies were still breached. Companies targeted for breaches averaged five or more separate breaches already. 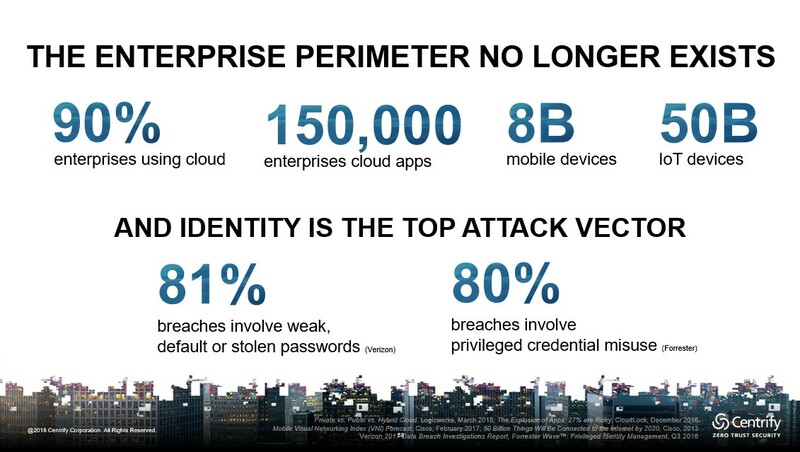 The following graphic underscores how identities are the new enterprise perimeter, making NGA and ZTS a must-have for any digital business. 53% of enterprises feel they are more susceptible to threats since 2015. Chase Cunningham’s presentation, Zero Trust and Why Does It Matter, provided insights into the threat landscape and a thorough definition of ZTX, which is the application of a Zero Trust framework to an enterprise. Dr. Cunningham is a Principal Analyst at Forrester Research serving security and risk professionals. 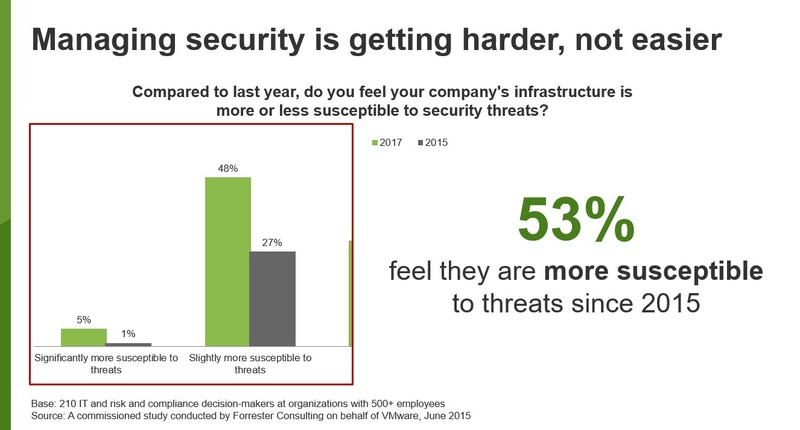 Forrester found the percentage of enterprises who feel they are more susceptible to threats nearly doubled in two years, jumping from 28% in 2015 to 53% in 2017. Dr. Cunningham provided examples of how breaches have immediate financial implications on the market value of any business with specific focus on the Equifax breach. 51% of enterprises suffered at least one breach in the past 12 months and malicious insider incidents increased 11% year-over-year. 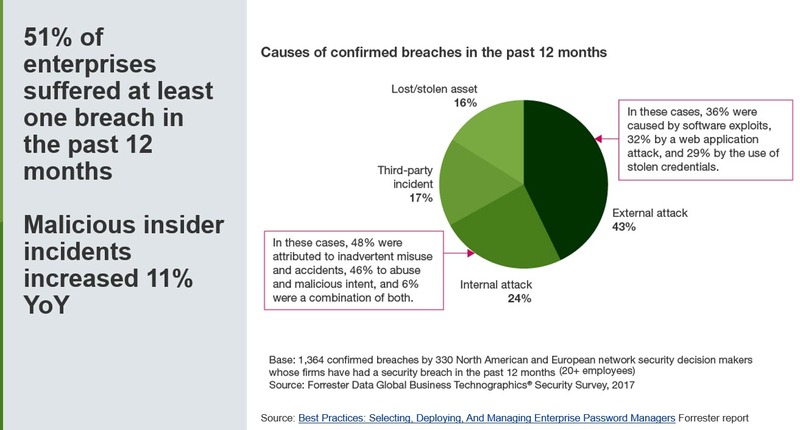 43% of confirmed breaches in the last 12 months are from an external attack, 24% from internal attacks, 17% are from third-party incidents and 16% from lost or stolen assets. Consistent with Verizon’s 2018 Data Breach Investigations Report use of privileged credential access is a leading cause of breaches today. One of Zero Trust Security’s innate strengths is the ability to flex and protect the perimeter of any growing digital business at the individual level, encompassing workforce, customers, distributors, and Akamai, Cisco, EdgeWise, Fortinet, Intel, Live Nation Entertainment and YapStone each provided examples of how their organizations are relying on NGA to enable ZTS enterprise-wide. Every speaker provided examples of how ZTS delivers several key benefits including the following: First, ZTS reduces the time to breach detection and improves visibility throughout a network. Second, organizations provided examples of how ZTS is reducing capital and operational expenses for security, in addition to reducing the scope and cost of compliance initiatives. All companies presenting at the conference provided examples of how ZTS is enabling greater data awareness and insight, eliminating inter-silo finger-pointing over security responsibilities and for several, enabling digital business transformation. Every organization is also seeing ZTS thwart the exfiltration and destruction of their data. 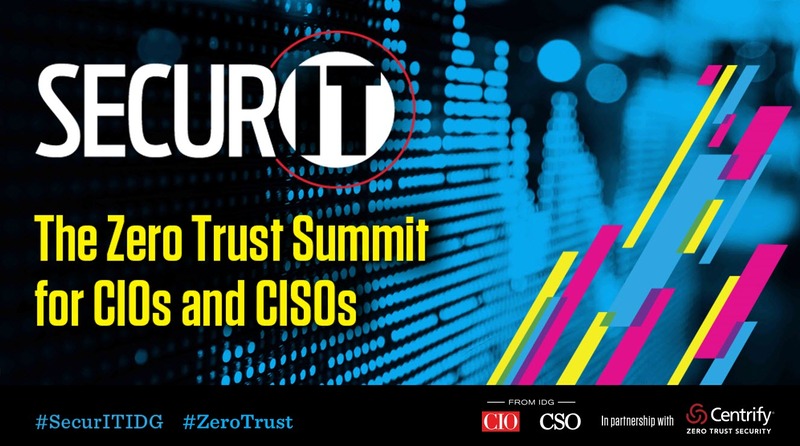 The SecurIT: the Zero Trust Summit for CIOs and CISOs event encapsulated the latest advances in how NGA is enabling ZTS by having enterprises who are adopting the framework share their insights and lessons learned. It’s fascinating to see how Akamai, Cisco, Intel, Live Nation Entertainment, YapStone, and others are tailoring ZTS to their specific customer-driven goals. Each also shared their plans for growth and how security in general and NGA and ZTS specifically are protecting customer and company data to ensure growth continues, uninterrupted. Zero Trust Security provides digital businesses with the security strategy they need to keep growing by scaling across each new perimeter and endpoint created as a result of growth. ZTS in the context of Next-Gen Access is built on four main pillars: (1) verify the user, (2) validate their device, (3) limit access and privilege, and (4) learn and adapt. The fourth pillar heavily relies on machine learning to discover risky user behavior and apply for conditional access without impacting user experience by looking for contextual and behavior patterns in access data. As ZTS assumes that untrusted users or actors already exist both inside and outside the network, machine learning provides NGA with the capability to assess data about users, their devices, and behavior to allow access, block access, or enforce additional authentication. With machine learning, policies and user profiles can be adjusted automatically and in real-time. While NGA enabled by machine learning is delivering dashboards and alerts, the real-time response to security threats predicated on risk scores is very effective in thwarting breaches before they start. Building NGA apps based on machine learning technology yields the benefits of being non-intrusive, supporting the productivity of workforce and business partners, and ultimately allowing digital businesses to grow without interruption. For example, Centrify’s rapid advances in machine learning and Next-Gen Access to enable ZTS strategies makes this company one of the most interesting to watch in enterprise security. Machine learning enables enterprises to adopt a risk-based security strategy that can flex with their business as it grows. Many digital businesses have realized that “risk is security’s new compliance,” and therefore are implementing a risk-driven rather than a compliance-driven approach. Relying on machine learning technology to assess user, device, and behavioral data for each access request derives a real-time risk score. This risk score can then be used to determine whether to allow access, block access, or step up authentication. In evaluating each access request, machine learning engines process multiple factors, including the location of the access attempt, browser type, operating system, endpoint device status, user attributes, time of day, and unusual recent privilege change. Machine learning algorithms are also scaling to take into account unusual command runs, unusual resource access histories, and any unusual accounts used, unusual privileges requested and used, and more. This approach helps thwart comprised credential attacks, which make up 81% of all hacking-related data breaches, according to Verizon. Machine learning makes it possible to accomplish security policy alignment at scale. To keep pace with a growing digital business’ need to flex and scale to support new business models, machine learning also assists in automatically adjusting user profiles and access policies based on behavioral patterns. By doing so, the need for IT staffers to review and adjust policies vanishes, freeing them up to focus on things that will grow the business faster and more profitably. On the other hand, end users are not burdened with step-up authentication once a prior abnormal behavior is identified as now typical behavior and therefore both user profile and policies updated. Machine learning brings greater contextual intelligence into authentication, streamlining the experience and increasing user adoption. Ultimately, the best security is transparent and non-intrusive. That’s where the use of risk-based authentication and machine learning technology comes into play. The main impediment to adoption for multi-factor authentication has been the perceived impact on the productivity and agility of end users. A recent study by Dow Jones Customer Intelligence and Centrify revealed that 62% of CEOs state that multi-factor authentication (MFA) is difficult to manage and is not user-friendly, while only 41% of technical officers (CIOs, CTOs, and CISOs) agree with this assessment. For example, having to manually type in a code that has been transmitted via SMS in addition to the already supplied username and password is often seen as cumbersome. Technology advancements are removing some of these objections by offering a more user-friendly experience, like eliminating the need to manually enter a one-time password on the endpoint, by enabling the user to simply click a button on their smartphone. Nonetheless, some users still express frustration with this additional step, even if it is relatively quick and simple. To overcome these remaining barriers to adoption, machine learning technology contributes to minimizing the exposure to step up authentication over time, as the engine learns and adapts to the behavioral patterns. Zero Trust Security through the power of Next-Gen Access is allowing digital businesses to continue on their path of growth while safeguarding their patented ideas and intellectual property. Relying on machine learning technology for Next-Gen Access results in real-time security, allowing to identify high-risk events and ultimately greatly minimizing the effort required to identify threats across today’s hybrid IT environment. 89% of organizations are relying on just a single security strategy to keep their mobile networks safe. 61% report that their spending on mobile security had increased in 2017 with 10% saying it had increased significantly. Just 39% of mobile device users in enterprises change all default passwords, and only 38% use strong two-factor authentication on their mobile devices. 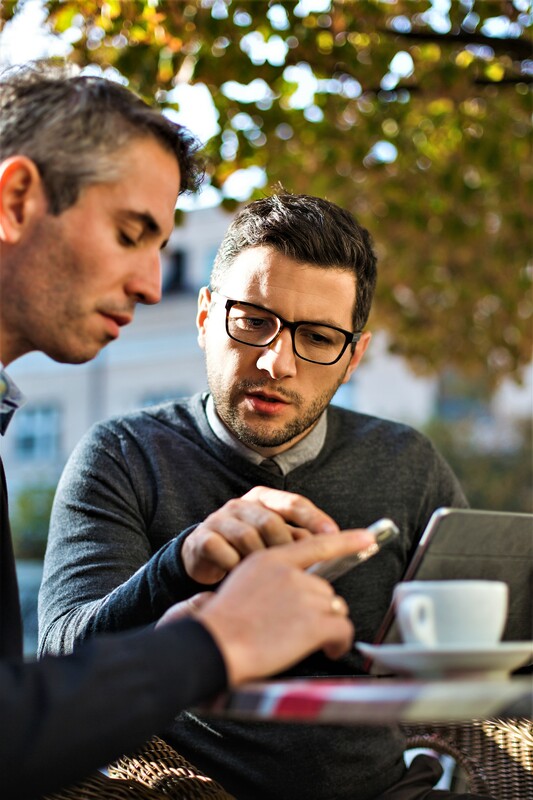 Just 31% of companies are using mobile device or enterprise mobility management (MDM or EMM). These and many other insights are from the recently published Verizon Mobile Security Index 2018 Report. The report is available here for download (22 pp., PDF, no opt-in). Verizon commissioned an independent research company to complete the survey in the second half of 2017, interviewing over 600 professionals involved in procuring and managing mobile devices for their organizations. Please see page 20 of the study for additional details on the methodology. The study found that the accelerating pace of cloud, Internet of Things (IoT), and mobile adoption is outpacing enterprises’ ability to scale security management, leaving companies vulnerable. When there’s a trade-off between the expediency needed to accomplish business performance goals and security, the business goals win the majority of the time. 32% of enterprises are sacrificing security for expediency and business performance, leaving many areas of their core infrastructure unsecured. Enterprises who made this trade-off of expediency over security were 2.4x as likely to suffer data loss or downtime. 79% of enterprises consider their employees to be the most significant security threat. The study points out that it’s not due to losing devices, inadvertent security errors or circumventing security policies. It’s the threat of employees using their secured access for financial or personal gain. 58% of senior management leaders interviewed view employees with secure access as the most significant threat. Security platforms that can stop credential attacks using risk assessment models predicated on behavioral pattern matching and analysis by verifying an employee’s identity are flourishing today. One of the leaders in this field is Centrify, who espouses Zero Trust Security. The following graphic from the study shows the priority of which actors enterprise leaders are most concerned about regarding threats, with employees being the most often mentioned. 32% of enterprises have sacrificed security for expediency and business performance leading to 45% of them suffering data loss or downtime. The study found that companies who sacrificed security were also 2.4x more likely to have experienced data loss or downtime as a result of a mobile-related security incident. For the 68% who prioritized security over expediency, just 19% had suffered data loss or downtime. 89% of enterprises are relying on just a single security practice to keep their mobile networks safe. Verizon’s study found that the majority of enterprises are relying on just one security practice to protect their networks. 55% have two in place, and just 14% have four. Of the four security practices, only 39% change all default passwords. Just under half (47%), encrypt the transmission of sensitive data across open, public networks. The following graphic from the study illustrates the percentage of enterprises who have between 1 and all four security practices in place. Just 49% of enterprises have a policy regarding the use of public Wi‑Fi, and even fewer (47%) encrypt the transmission of sensitive data across open, public networks. A startling high 71% of respondents use public Wi-Fi networks for work tasks, despite their companies prohibiting their use. Taking risks with unsecured Wi-Fi networks for expediency and business performance being done at the expense of security supports a key finding of this study. Nearly one in three (32%) of enterprises are sacrificing security for expediency and business performance, including accessing unsecured Wi-Fi networks. The following infographic from the study explains a few of the many security threats inherent in the design and use of public Wi-Fi networks. $86B was spent on security in 2017, yet 66% of companies have still been breached an average of five or more times. Just 55% of CEOs say their organizations have experienced a breach, while 79% of CTOs acknowledge breaches have occurred. One in approximately four CEOs (24%) aren’t aware if their companies have even had a security breach. 62% of CEOs inaccurately cite malware as the primary threat to cybersecurity. 68% of executives whose companies experienced significant breaches in hindsight believe that the breach could have been prevented by implementing more mature identity and access management strategies. One of the most valuable findings from the study is how CEOs can reduce the risk of a security breach meltdown by rethinking their core cyber defense strategy by maturing their identity and access management strategies. However, 62% of CEOs have the impression that multi-factor authentication is difficult to manage. Thus, their primary security concern is primarily driven by how to avoid delivering poor user experiences. In this context, machine learning can assist in strengthening the foundation of a multi-factor authentication platform to increase effectiveness while streamlining user experiences. Machine learning is solving the security paradox all enterprises face today. Spending millions of dollars on security solutions yet still having breaches occur that are crippling their ability to compete and grow, enterprises need to confront this paradox now. There are many ways machine learning can be used to improve enterprise security. 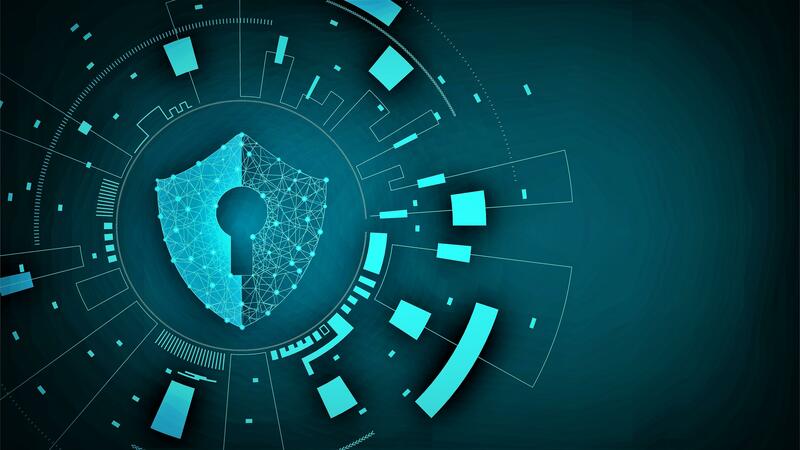 With identity being the primary point of attacks, the following are five ways machine learning can be leveraged in the context of identity and access management to minimize the risk of falling victim to a data breach. Thwarting compromised credential attacks by using risk-based models that validate user identity based on behavioral pattern matching and analysis. Machine learning excels at using constraint-based and pattern matching algorithms, which makes them ideal for analyzing behavioral patterns of people signing in to systems that hold sensitive information. Compromised credentials are the most common and lethal type of breach. Applying machine learning to this challenge by using a risk-based model that “learns’ behavior over time is stopping security breaches today. Attaining Zero Trust Security (ZTS) enterprise-wide using risk scoring models that flex to a businesses’ changing requirements. Machine learning enables Zero Trust Security (ZTS) frameworks to scale enterprise-wide, providing threat assessments and graphs that scale across every location. These score models are invaluable in planning and executing growth strategies quickly across broad geographic regions. CEOs need to see multi-factor authentication as a key foundation of ZTS frameworks that can help them grow faster. Machine learning enables IT to accelerate the development of Zero Trust Security (ZTS) frameworks and scale them globally. Removing security-based roadblocks that get in the way of future growth needs to be the highest priority CEOs address. A strong ZTS framework is as much a contributor to revenue as is any distribution or selling channel. Streamlining security access for new employees by having persona-based risk model profiles that can be quickly customized by IT for specific needs. CEOs most worry about security’s poor user experience and its impacts on productivity. The good news is that the early multi-factor authentication workflows that caused poor user experiences are being redefined with contextual insights and intelligence based on more precise persona-based risk scoring models. As the models “learn” the behaviors of employees regarding access, the level of authentication changes and the experience improves. By learning new behavior patterns over time, machine learning is accelerating how quickly employees can gain access to secured services and systems. Provide predictive analytics and insights into which are the most probable sources of threats, what their profiles are and what priority to assign to them. CIOs and the security teams they manage need to have enterprise-wide visibility of all potential threats, ideally prioritized by potential severity. Machine learning algorithms are doing this today, providing threat assessments and defining which are the highest priority threats that CIOs and their teams need to address. Stop malware-based breaches by learning how hackers modify the code bases in an attempt to bypass multi-factor authentication. One of the favorite techniques for hackers to penetrate an enterprise network is to use impersonation-based logins and passwords to pass malware onto corporate servers. Malware breaches can be extremely challenging to track. One approach that is working is when enterprises implement a ZTS framework and create specific scenarios to trap, stop and destroy suspicious malware activity.